Be the first to share your favorite memory, photo or story of Cheri. This memorial page is dedicated for family, friends and future generations to celebrate the life of their loved one. Cheri Ann (James) Pierce, age 56, of Mattoon passed away peacefully at 2:18 p.m. on Wednesday, March 27th, 2019 knowing how much she was loved by her family and friends. Funeral Services honoring and celebrating her life will begin at 11:00 a.m. on Saturday, April 6, 2019 at the First United Methodist Church, 1601 Charleston Avenue, Mattoon, Illinois with Pastor Ron Dickinson officiating. Burial will follow at Dodge Grove Cemetery in Mattoon. Visitation for family and friends will be held from 4:00 p.m. until 7:00 p.m. on Friday, April 5, 2019 at Schilling Funeral Home, 1301 Charleston Avenue, Mattoon, Illinois 61938. Cheri was born on September 28, 1962 in Alton, Illinois, the daughter of Harlan D. and Cynthia A. (Guthrie) James. She married Kevin Macklee Pierce on November 1, 1986. Survivors include her loving husband, Kevin Pierce of Mattoon; sons, Blake Pierce, Cole Pierce, and Derek Pierce, all of Mattoon; brothers, David James of Atlanta, GA, Marc (Karen) James of Bossier City, LA; mother-in-law Marilyn Doty; nieces, nephews, cousins and extended family; and her beloved dog, Callie Ann. Cheri was preceded in death by her parents. Cheri graduated from Centennial High School in Champaign, Illinois in 1980, and furthered her education at Eastern Illinois University where she graduated in 1984. It was while she was at E.I.U. that she began dating Kevin. Cheri worked for several years in marketing for the hospitality industry, and most recently in the accounting office at Anamet Electrical. However, she always felt that her greatest accomplishment was being a stay at home mom for 10 years. Cheri was diagnosed with incurable brain cancer in March 2018. She chose to fight for the chance to spend a couple more months with her family and friends. Her road was not easy, but she did the best she could. She kept her sense of humor right up until the end and enjoyed every additional moment she had with everyone, especially her husband and three boys. Cheri was an active member of the First United Methodist Church of Mattoon. She had served as a volunteer for the American Cancer Society and was involved with the Charleston Tourism Board. She was a wonderful homemaker and a loving devoted mother. Her smile could light up a room and she loved to cook and spend time with her family. 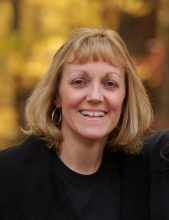 Over the years, Cheri enjoyed playing bingo with friends and watching her boys play sports. She was always involved in PTA, Mattoon Junior Football League, and other school events and activities that her sons were involved with. As an avid football fan of the Indianapolis Colts, she loved attending games with her family; or anything that her boys liked to do, as long as it meant time together with them. Cheri will be remembered as a very caring individual who always had empathy for others, like sending hundreds of cards during her lifetime, as she believed that people truly appreciated the gesture. She will be greatly missed by all those who knew and loved her. Memorial donations in her honor may be given to the American Cancer Society. Online condolences may be expressed at www. schillingfuneralhome.net or Schilling Funeral Home’s Facebook page. To send flowers or a remembrance gift to the family of Cheri Ann Pierce, please visit our Tribute Store. "Email Address" would like to share the life celebration of Cheri Ann Pierce. Click on the "link" to go to share a favorite memory or leave a condolence message for the family.